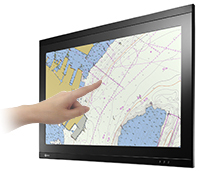 EIZO offers a 46-inch chart table monitor with touch functionality as a practical solution to paper nautical charts. It features a fully flat design, PCAP touch technology, and advanced functionality for efficiency and high performance. EIZO's lineup also includes 19, 25.5, and 46-inch monitor solutions with high visibility for reliable navigation. Providing ships and offshore structures with equipment that will continue to operate optimally even in harsh conditions is essential for maritime. 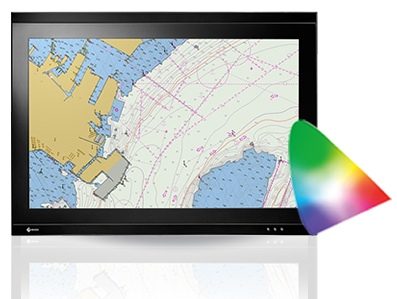 EIZO's marine monitors meet the important requirements for high performance route planning and navigation. Formal approval dates for international standards and classifications may vary. Meeting the highly specialized calibration requirements of ECDIS requires a thorough understanding of color values. EIZO’s experience with delivering precise color calibration to high-end markets provides maritime with highly accurate ECDIS display. Backlight brightness, gamma, and RGB color settings are calibrated at the factory so each monitor achieves color reproduction appropriate for ECDIS. 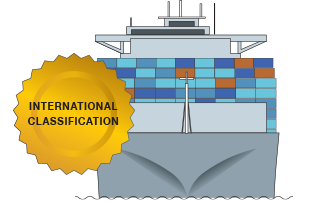 DuraVision maritime monitors meet IEC 61174, IEC 62288, and IEC 62388 international standards for ECDIS and Radar applications. Formal approval dates for international standards may vary. Contact EIZO for date of compliance for IEC 61174. To meet the requirements of different environments, both standard (mouse and keyboard input) and touch panel models are available in 19-inch or 25.5-inch. The touch panel models accept touch input from a bare finger or dedicated stylus and supports multitouch operation. They are also highly resistant to dust and water droplets to minimize unintended input for a reliable touch experience. EIZO offers optional optical bonding for select marine monitors to provide exceptional visibility and increased durability. 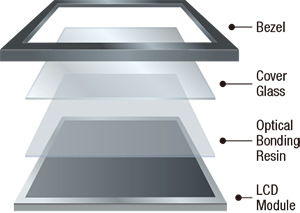 Optical bonding is produced in-house to meet the needs of specialty markets while ensuring the high quality of each monitor. To learn more about optical bonding, click here.